When building a website, you may not want random visitors snooping your pages until you are ready for them. Even while some programs allow you to build your site on your local computer and then publish when you are finished, you still may want to test your site on the live server before opening to the public. In this case, you may want to place an "Under Construction" or "Coming Soon" page in place. You can accomplish this in your cPanel. The problem lies with how your hosting server looks for the first page of your site, also called the index page. The server looks for pages that are named index.htm, index.html, index.php, and default.htm, in that order. If it finds a file with one of those names, it places that as the landing page of your website. Website design programs most often create an index.html or index.php page. When publishing your site, even for testing, it is likely that the first page will begin to display to the public. This article will guide you on how to create and set up a placeholder page so that you can work on your site in the background. Enter the File Manager. Be sure to navigate to the root folder for the domain you are working with. If it is the primary domain, use public_html. Click on New File, found in the left-hand side of the toolbar at the top of the page. Next, give the file a name. Our example will be named comingsoon.html. Click on the Create New File button to complete its creation. Note this simply creates an empty file. Now we need to edit the empty file. 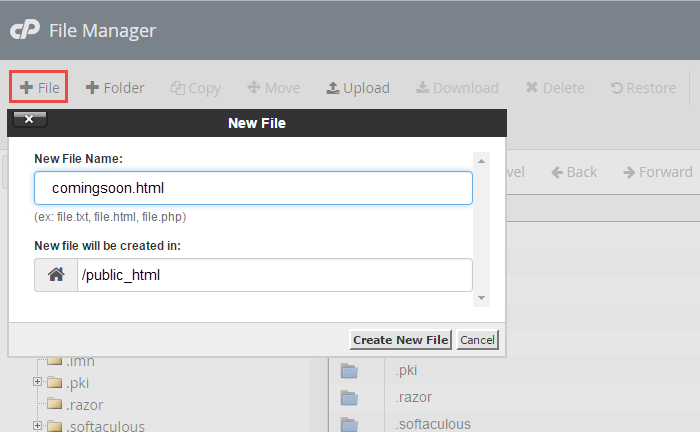 Highlight the filename and then click on HTML Editor. This allows you to create the page visually, no coding needed. You can make it as fancy or simple as you wish. In our example we will make it very simple. Once you have designed your page, click on the Save button in the upper left of the tool bar. It appears as a floppy disk. Now that you have created the page, you need to set the filen ame as your default for your website. Those instructions are found in our article on How to change your default index page in .htaccess. Below is a screenshot of how the page will display on the web once that is completed. Hello! I am very new to website building, hosting and the whole 9 so I appreciate your assistance and patience! I am trying to follow your above directions for activating an "under construction" page, but I'm already off-course. I need a landing page for my website (NOT my "primary domain). when I go to cPanel and click on File Manager, a Directory Selection dialog box appears asking me to choose among a) home directory, b) webroot (public_html/www), c) public FTP root (public_ftp) or d) document root (with a dropdown menu allowing me to choose from amongst my addon and parked domains). As you can see, there appear to be 3 root folder options. I'm not sure which to choose (option b, c or d?) to follow your instructions. Can you help me, in simple language? Thank you so much! Crystal, you will want to select 'web root', and then navigate to the folder that your add-on domain is pointed to. Feel free to have a look at our article <a href="http://www.inmotionhosting.com/support/website/getting-started-guides/where-to-upload-files">that has more detail about how to find your document root for a particular site</a>. If you followed the directions in this tutorial, and you named the page "comingsoon.html" then you can simply rename the page to something else like "old-comingsoon.html" which will deactivate it. What if there isnt an option to html edit the new file but only code editor? Can you help me with the code I need to create a 'under construction' landing page?? If you're in the File Manager (not the legacy one), then it should give a few different options to edit the code. The Code Editor is okay to edit the file too, if you want to use it. Unfortunately, we do not provide coding support as it is beyond the scope of our support. Sounds like your host has a default landing page set up. You may have to remove it via file manager. Thank you for contacting us. What is the full error you are getting? Can you provide a link to the error message? Hello, i have created a coming soon page and placed this in my .htaccess file. but my website is not displaying the comingsoon file still.. Thank you for contacting us. Make sure your website is pointed to your host. For example, if you are hosted with us you should Point to InMotion Hosting. What happens when you visit your site? Do you get an error? how can i undo the cpanel underconstruction? it cant load the page. I am seeing a coming soon page, but not one from cPanel. Also, your domain is not pointed to us, so I am unable to see an account on our servers. You will want to check your main index page and that should be the one that is the coming soon page. Replace that one with the first page of your site and it should display properly. I just put my website to under construction mode, please how do i restore or make it active for people to have access. If you are ready for the world to see your site, simply rename or delete the coming soon page. Thank you for your question. You can setup a custom Landing page in cPanel. It will then load the custom page by default. What about if we have more than a website on the same hoem directory and we wish to display the message for only one site? Is this possible? Yes, the public_html is the root folder for your primary domain. Other addon domains will have their own home folders (usually named the same as the website, only the public_html is different in that regard) so they will be unaffected by files in other folders. i created the webpage for under construction now how do i remove this so that my website gets online ? To do so, you will simply revert the changes that you made to your .htaccess file and remove the file that you created.